In 2009, I played a wizard named Imsril in a Red Hand of Doom game that the DM (kjones) kept an excellent campaign journal for on these forums. In the intervening decade, I've spent most of my roleplaying time on the other side of the screen. I ran Red Hand of Doom once, shortly after I finished playing, and it was a blast; though trying to cram it into one winter vacation meant a frantic pace and a somewhat rotating cast of characters that left it a little shorter on character-driven RP than I usually prefer. I recently finished grad school and moved across the country, which meant leaving behind the group that I had been GMing for 6 years across three campaigns (two of whom had played in kjones' RHoD with me--the players of Cam and Gale). This led to some reminiscing, which gave me the idea of revisiting Red Hand of Doom again with a fresh party in a new city. And after rereading kjones's journal to help myself prep, I decided that I should keep a journal here as well. One of my New Year's Resolutions was to keep better notes about my RPGs, and it might be interesting to other people as well. I started GMing 5e before the Monster Manual was out and I haven't looked back (... mostly), so I decided that the best thing to do would be to run a 5e adaptation, and I stumbled across https://www.kickstarter.com/projects...de-and/updates. Unfortunately legal issues seem to be preventing more people from purchasing it currently, though I hope that gets resolved some day? Zehra Daardendrian, a Red Dragonborn Paladin of Conquest. Once heir presumptive to the Azran Empire (think the Ottoman Empire circa 1500), she found herself pushed aside when a younger brother was born. After a few years being groomed for a military life, she set out her own in search of honor, fortune, and a place to become the benevolent warlord of. Heavily armored, battleaxe-wielding, do-not-****-with attitude. When asked whether it's better to rule through fear or love, she isn't quite sure what you mean by "rule through love". Built around inflicting fear (with both the Conquest Paladin ability and a Dragonborn feat), wading into melee, and brawling things down. Aideen Theasdaughter, a Half-Elf Phoenix Sorcerer (from UA). Born to an elf mother in a small community in the southern Witchwood, at a young age Aideen accidentally caused a forest fire, prompting her and her mother to move to exile in the Giantshield mountains. After her mother's death (for which she blames her elf kin), she left for a life of adventuring. She tends to not understand people very well, given that she grew up in isolation, and is used to being rejected when people realize her heritage. This makes her very loyal to her (few) friends. She is close companions with Zehra, who has fire resistance. Built around blasting the everloving stuffing out of people with fire spells. I'm interested in seeing how the player balances 18 Charisma with not understanding people very well! Salen Glarosk, a Human Grave Cleric of Wee Jas. An orphan with no memory of his family, he was raised by the academy of Wee Jas in the large city of Nexus. Upon coming of age, he devoted himself to the temple and became a cleric. Upon raising concerns about the propriety of senior clergy accepting "donations" from local necromancers (presumbably to look the other way), Salen was sent on a quest to retrieve the long-lost works of the Wizard of Peχavn, which are largely believed to be a myth. Though at the start of his 14-year quest Salen believed this as well, he has since come to believe they are real, and may be in the Elsir Vale. Grave clerics are kind of silly. They double down on one of 5e's cheesiest mechanics (that damage past hitting 0 is ignored, so it is often best to wait until somebody drops to heal them). So we'll see how I feel about this in play. Cora Sandhill, a Lightfoot Halfling Inquisitive Rogue. Born in the part of the Azran Empire most equivalent to southern Egypt, she spent her childhood with parents who made a living searching mysterious ancient ruins for goods to sell. She loved learning everything about them, and left in protest when her family started working with tomb strippers who were intersted only in profit, and set out for adventure. She knows Zehra, having travelled in the same convoy North from the Azran empire. Designed to be able to sneak attack without needing to hide or have an ally around. Curious how it will work. Hoss Basingstoke, a Human Spell-Less Variant Ranger (UA) Hunter. Hoss is the former small-town sheriff of Red Rock, but prefers to keep to himself; his least favorite part of the job was the recognition: what's so great about being good at killing things? He was forced out of the job a few weeks ago, though, after failing to track down the murderer of a young human child, having exonerated the public scapegoat, a young orc. Frustrated and humiliated and remembering his childhood dreams of making it out of Red Rock, he has set out across the Vale. Hoss and Aideen know each other at least a little, as Red Rock is where Aideen and her mother purchased supplies. He's a archery ranger, and the spell-less variant gives some fighter manuevers. He's aiming mostly to synergize well with the rest of the party for those. Zehra has heard rumors about goblin raids in the western vale, and figures it might be a chance to make more of name for herself. Aideen is happy to join her best friend. While searching the archives in Dennovar, Salen began having dreams of the Witchwood, which he believes are divinely inspired. Hoss has got a buddy from Red Rock who moved to Drellin's Ferry to become a brewer, so he figured he'd tag along with the people heading that way. By the time they've gotten there he's been swayed by their excitement to accompany the party in earnest. This is the first serious campaign I've started since Xanythar's guide came out, and most of my players decided to take full advantage of it. Not a single character is playing a core archetype. The conversion guide seems like a pretty good starting point, but I suspect it will need a bunch of tweaking to have the right power level. All of the players seem to have built pretty tough characters, despite some of them not having a lot of experience. This group has played together as a group once before, in a five-or-so session mini-campaign I ran recently. That game didn't have a whole lot of structure or plan, and the defining characteristic of the game was two party members each coming up with a plan---either of which would have been reasonable in isolation---and then executing them both, to hilarious disaster. I'm excited to see how they do when there is something real at stake. The party has got a handful of decent connections between characters, though Salen is pretty disconnected. I hope some more can develop, since that is one of my favorite parts of the game. Game starts tomorrow. I wasted a bunch of money on miniatures, filled out a bunch of monster trackers, and printed out a bunch of full-color maps with my employer's printer. Let's roll! It's been about ten years since I ran Red Hand of Doom for msully4321 and company, and probably at least seven since I've posted here. I'm excited to revisit both! I think you and the players have done a really good job setting up party cohesion, with strong and interesting interpersonal relationships to build on. I'm really curious to see how everyone will react to learning about the Red Hand. My strongest advice, the thing I wish I would have done most differently if I could go back and change anything about how I ran this campaign: take your time. Let things develop at their own pace - and in their own direction. Don't rush the big story beats, you'll get there when you get there. And think about how much more interesting it will be if you don't! Meeting up at 7, we spent about half an hour finishing up character details, tweaking things, wasting time. I then had everybody give a character introduction (during which I let them all talk longer than I should have; we spent longer on this than we needed to). I told the party that I don't normally run published adventurers, and obviously the adventure was written with some assumptions about what the party would do. I suggested that they don't worry about that too much: engage with the fiction, but don't look for rails. Just do what you think makes sense, and I'll make it work, even if it isn't what James Jacobs and Richard Baker expected you to do. Then we dived in, with the mauruder ambush along the Dawn Road. The party all made their Perception checks, so everybody got to go in the opening round. About half of those were dead before any of the others came out. Zehra had no ranged weapons, so asked to hop on her horses's back and from their to the embankment. Made an athletics check, no sweat, though the (intelligent, talking) horse wasn't thrilled about it. Salen also climbed up the embankment and dropped a Spirit Guardians, which I think killed some hobgoblins. Then the cleric came out and dropped a spiritual weapon and toll the dead. I decided the cleric had spent the previous round casting bless, and then I forgot to apply the bless bonus literally every single round. Cora, Aideen, and Hoss stayed down in the road taking shots at hobgoblins regulars. Salen moved up to hit the cleric with the spirit guardians, but then one hell hound ran up and breathed on Salen and Zehra. Next, the bladebearer moved came out of the farmhouse, and just barely had enough movement to make it to connect with Salen for three hits, dropping him. The other hell hound ran into the round and engaged the characters still there. Then, with the cleric on the ground bleeding out, and 15 points of lay on hands to spend, Zehra decided to roar to try to scare the enemies: unfortunately, the bladebearer made his save, which would make the rest of this a lot harder. Zehra took a bunch more damage as the party in the road finished off the hell hound and climbed up the ravine, then laid on hands Salen, who healed himself and moved out of the line of fire. Things were looking pretty in control when the hobgoblinc cleric rolled a nat 20 to inflict critical wounds on Salen, who was quickly back down. Then the Bladebearer brought down Zehra, and the situation was dire. Next round he moved into range of Aideen and brought her down also, so it was 2 PCs up and 3 NPCs of consequence, and I was genuinely worried I was about to wipe the party on the opening encounter. Fortunately for everyone the hell hound was having garbage luck and being pretty ineffective. Cora and Hoss, after everybody else was down, spent a round of two fighting and killing the hell hound , before Hoss ran over to Aideen and fed her a potion. Then Cora finally killed the bladebearer, describing her killing blow as "elegant", in response to the bladebearer's showiness. Aideen ran over to her old friend Zehra, fed her a potion, and then killed the doom fist cleric with a quickened scorching ray. The hogboblin regular who had been ineffectively taking potshots with a longbow from the other side of the road decided he wasn't getting paid enough for this, and peaced out, and the fight was over. Then it was searching the corpses, finding the bodies of the travellers killed on the road, snagging a bunch of gold, and heading to town, bruised, haggared, and covered in blood. After a bit of racial profiling, the head guard at the watchpost, Sergeant Hersk, was ready to let them in, but decided to ask about why they were covered in blood. They told him, he talked about hobgoblin raids on the city. Asking for places to say he said the main options were The Old Bridge Inn and the Green Apple, and he preferred the Old Bridge. The party decided that the Old Bridge must be a tourist trap and bee-lined for the Green Apple. Alright then. Zehra and some of the others met Delora Zann, a former adventurer turned livery stable owner and town councilwoman, when stabling Zehra's horse, and Cora Sandhill went over to the Old Bridge to chat with the other halfings (her cousin's wife's brother moved up to Drellin's Ferry a while back, maybe someone knows him?). An unusually large amount of time was dedicated to the party figuring out the best way to take a bath. As they got ready for bed, Norro Winston the Town Speaker showed up, offering to hire them to drive away the goblin menace. Hoss wanted to sleep before negotiating, but Winston was insistent. Some discussion of the details ensued, and the party agreed, without even trying to negotiate the price up! Next session will see them travelling into the Witch Wood, to explore Vraath Keep and try to drive out the hobgoblin menace. But of course, they will discover that things are much more dire than anybody could belive. - Tuning encounter difficulty is going to be tricky. This fight was sharper that I had hoped, and could have easily gone much worse. - Everybody had a pretty good chance to show off, except for Salen, who spent most of the fight dying. I think Salen learned an important lesson about positioning himself in the presense of incomplete information. - Aideen nailed a hell hound with a scorching ray, only to realize it was immune to fire. Aideen is nearly entirely ineffective against enemies with fire resistance, having basically just chromatic orb to cast. - Cora, whose player is a mechanical engineer, is very upset that Drellin's Ferry hasn't repaired the old dwarf bridge, since the pilings are still in place and that is the hard part. When she complained about it to Norro Winston, he told her that if he had two more like her on the Town Council, he'd have it rebuilt years ago, but now isn't the time for petty local politics. - When Cora killed the first Hell Hound, I said: "I've been at this for about a decade and don't usually change my style much, but I've been watching Critical Role recently and liked what Matt Mercer does when a nontrivial enemy is killed, so... how do you want to do this?" - Cora got three of the four major kills in this fight. - Zehra has 16 charisma but deliberately only has proficiency in intimidate, not persuasion or deception. "I'm not here to make friends" - her, probably. - Sorrana (I think): "What brings you to Drellin's Ferry?" Zehra: "Our business is our own." Cora: "We're going to explore Vraath Keep"
- Apparently Cora's backstory slightly changed, and actually her clan was mostly killed by raiders or something. More orphans! - I had been fighting off a cold all week, and I think the four hours spent standing up talking might have tipped the balance. - I wrote up more detail about the fight than the stuff in Drellin's Ferry, which I think might be backwards, but the post is already super long and I am tired of writing. - Hoss's player is super nervous about part survivability after the near-run thing in the first battle. From my perspective the two things that got them in trouble were letting the party get divided up in a way that they couldn't focus fire, and the cleric getting in a position to go down easy. - Play was pretty slow, as people get used to their new characters and abilities. Hopefully things will speed up a bit, though I know from long experience that they never speed up as much as I wish they would. Session took about 4 hours. I'm super excited to dive into the Witchwood, but I'm not sure when we'll be playing next. Aideen's player is travelling for the next two weeks (though she might be able to Skype in next week) and Cora's player is travelling the week after that. We've got five players, and in general I'm willing to run a player down, but not in the first act like this. I want every single person there when they learn about the Red Hand. Last edited by msully4321; 2018-09-14 at 03:33 PM. Count me extremely interested in this; I recently picked up RHoD myself, and am considering running a war plot in my home game starting around 5th level. RHoD seems great at this, and I'm hyped to see your opinions on how legendary dragon encounters play out. Take your time and post when you can. Click my Vulpix to feed it yummy berries! The second session is scheduled for Wednesday, October 10, after deciding that trying to have players VC in is probably not worth the hassle and trouble some frustrating attempts to schedule a game for this upcoming week. The basic upshot of all of this is that if this game is going to be able to run at all regularly, the quorum needs to be 4 players + me. But I think that everybody needs to be there when they properly discover the threat that the Red Hand poses to the Vale. This means that my top priority for the next session is to make sure that happens. There probably isn't enough time for the party to deal with the hydra, meet Jorr, and clear out Vraath Keep in one session starting at 7:30 PM on a weekday, which means making the information available in some other way. The party fortunately recognizes the need to gather intelligence, and Zehra's player suggested that the party try to bait out an ambush on the road by pretending to be a merchant convoy. If they do that, then no sweat: their plan works and they get ambushed by some more raiders they can interrogate. If they don't end up doing that, then they'll have a random encounter with some goblin wolf rider scouts. It's on the random encounter table and everything! This sort of planning, and the trick of having the approximately same thing happen no matter what the party does is not my normal style, and I don't like doing it. Especially because I expect several of the players to read this campaign journal once the campaign wraps up and maybe feel pretty cheated if they had a clever plan and it turned out that just blundering into the Witchwood would have served just as well! But the scheduling situation is extremely dire if I'm insisting that everybody can make it (to the point where it honestly wouldn't be worth even trying to continue the game at all), so it really is just critically important that I get the game to a narrative point where I'm comfortable about players missing sessions. If they interrogate somebody, my plan is to directly lift a line from kjones' game, with a hobgoblin telling the party about "the hand that comes in the night and smothers the babe in his cradle. It is the scourge that will scour the Vale, leaving behind nothing but destruction." Something I am nervous about is the transition between chapter I and II, and providing a good reason for the party to go check out the Blackfens/Rhest other than "there is a barricade to the North". Having someone explicitly suggest they recruit the Tiri Kitor elves could be good, though it would also be kind of cool if the Tiri Kitor showing up on owlback is sort of a surprise? When I played in the game, we apparently headed north after destroying the blockade just based on the indications on horde's map that they had someone in the swamp, probably combined with a little bit of metagamey "looking for rails"? When I GMd this last, I just railroaded pretty hard and basically just told the party they headed north after destroying the barricades---this is deeply contrary to my normal GMing style and I feel suitably ashamed of it, but the campaign was on a pretty tight schedule and I didn't have anything good for it. Like I told the party, I'm fine if they don't follow the module's intended path---but I'd like it to be because they've found something that they think would be better to do, and not just because I haven't given them enough information about why something might be important (which the adventure doesn't do about going to Rhest). One post I read suggested trying to recruit a specific wizard who lived as a hermit in the Blackfens (who had since died), but that seems like the party would just cast Sending (which is only 3rd level in 5e) and give up when they get no response without trudging into the swamp? Anybody have good ideas about this? Last edited by msully4321; 2018-09-30 at 01:17 AM. Especially because I expect several of the players to read this campaign journal once the campaign wraps up and maybe feel pretty cheated if they had a clever plan and it turned out that just blundering into the Witchwood would have served just as well! The timer has started on the adventure. It's a 65-day schedule, and their plan attracts an ambush on day 2 or 3, rather than the random Warg encounter on day 5 or 6. That's an extra four days to delay the goblin horde; that is a pretty substantial buffer they just earned with their cleverness. Something I am nervous about is the transition between chapter I and II, and providing a good reason for the party to go check out the Blackfens/Rhest other than "there is a barricade to the North". Or, perhaps, they hear tell of a certain dragon that a certain lord has history with—one they'd need to slay in its swamp before there was a chance of it joining with the horde. Maybe even convince it to help slay the goblins coming to invade its lair. Nothing could make this fight more winnable than an allied dragon of the party's own. In case you haven't seen it, this may be a helpful resource. Of course, it is for 3.5 edition. are you asking us to do research into a setting you wrote yourself? "If a player behaves in a way you don't want them to behave, talk to them about it. If they continue, stop playing with them. " By RAW, you have to stop playing with the guy. Rereading my last post, I realized it was maybe written assuming too much knowledge about the adventure, which I'll try to do less of in the future. We finally were able to schedule and play a session! We actually played two Wednesdays ago (the 10th), but I've been swamped since then and this took a while to get out. I scheduled it at for 7 but an accident caused some terrible traffic and meant that the last players didn't arrive until around 7:40. Last session saw the party arriving---battered but unbroken---in the frontier town of Drellin's Ferry, where they were hired by the Town Speaker Norro Winston to investigate and drive off the hobgoblin threat in the Witchwood. Before setting out, the sorcerer Aideen stopped by the local general store to buy some more potions, and the friendly-seeming shopkeeper, Jarrett Nurth, gave her one free potion if she bought three, since she was doing good work for the town. Unbeknownst to the party, though, Nurth is a secret devotee of Erynthul, the god of slaughter, and the free potion is actually just poison. They're gonna be mad about that one. Both Norro Winston and the retired adventurer Delora Zann had suggested the party seek out Jorr Natherton in the Witch Wood as a guide, but first they decided to go chat with the druid they had heard lived near town, Averthal. They found Averthal meditating in his grove, and asked for guidance on traveling into the Witch Wood, only to be told that Averthal focuses on "tending to the outskirts, to the liminal spaces between man and nature", and had not actually spent much time, as such, in the Witchwood itself (prompting (I think) Cora's player to exclaim "this guy is the worst"). They did find from him that many animals had fled monsters in the Witch Wood, and they set off, on the side trail they were told led to Jorr's. After about three hours of hiking along a single-track game path through the Witch Wood, the party came upon a cabin up along a lake shore, which they figured was Jorr's. Three large dogs immediately burst out from underneath the cabin and ran at the party, prompting Aideen to use Create Bonfire to place a fire in between them and the dogs. This worked to stop them---though so would have doing nothing: the dogs were well-trained. Jorr then came out of his cabin and---in the best Clint Eastwood "get off my lawn" voice I could manage, asked "what are you doing in my woods?" They told him that they were sent by Norro Winston to drive the goblins out, and fortunately for them it turned out that Jorr *really* hates goblins, so he is easy to hire as a scout (though Hoss grumbled some about Jorr muscling in on his turf! Ain't he a good enough scout?) . Aideen is somewhat more interested in befriending Jorr's dogs (who I named Bowser, Hey You, and Fido) and insists that at least one dog accompany them. The party (I think Hoss?) asked specifically if there was a back route to Vraath Keep that avoids the Dawn Road. I looked at the map for a second, and Jorr told them that there was---but the catch was it would be a good 10 miles out of the way. They wouldn't be able to make it to Vraath Keep until the next day. I was thrilled about this because it burns time off the calendar and let them detour around the Hydra encounter and get to Vraath Keep quicker. So the party departs with Jorr, takes a long loop through the Witch Wood, and eventually reaches Vraath Keep. Scouting ahead, they find, up on a hill near the crossroads of the trail they were on and the Dawn Way, Vraath Keep, a small and dilapidated stone fort, with a dirt path up to a broken front gate and a large broken gap in a side wall accessible by scrambling up a forested hillside. There were no obvious signs of occupancy from a distance, save a manticore occasionally seen circling above. The party regrouped and decided that the best route of attack was straight through the hole in the side wall, since it left them exposed for the least amount of time. They successfully snuck up to the wall---because the hobgoblins in the Keep were *really* not doing their due diligence and hadn't even posted sentries. Peeking in they couldn't see anything, but they could hear the sound of snoring and some low, unintelligible conversation in Goblin. The party decides to kick in the door and go in swinging. The kicking in the door turns out to be metaphorical, since there was a giant hole in the wall of the barracks---left behind from the battle with the giants several hundred years past. The barracks contained 2 sleeping hobgoblin veterans, 2 veterans playing cards, and a minotaur guarding a door. The party gets the drop on everybody pretty completely, and started focusing fire on the minotaur. A battle breaks out in the barracks, with the hobgoblins pretty hobbled by two of them needing to get out of bed (and not being in armor!) and two of them failing their saves against Zehra's dragon roar. As soon as he can, Karkilan the minotaur opens the door behind him and goes through it to warn and protect Wyrmlord Koth. Zehra followed him through the door, the minotaur's readied attack bouncing off her armor. Zehra then cleaves viciously into Karkilan, buoyed by Salen's (incredibly good!) Path to the Grave ability, but---to Zehra's great chagrin---Karkilan survived it, only to be brought down by (I think) Salen's spiritual weapon. Opening the door, though, brought the commander of the fort, Wyrmlord Koth, into the fight, even though he would have preferred to stay out of it and focus on packing up his notes. The 5e adaptation I'm using has Koth as a Hobgoblin Devastator (from Volo's), and they have the fantastic ability to exempt allies from AOE spells. So Koth pulls a little piece of bat guano out of a pouch, sniffs it, and launches a fireball into the barracks. He then bellows at the top of his lungs for the "worthless manticore" to come "do something useful", and runs up the staircase to the upper level of the tower. The fight down in the barracks then gets a lot nastier, as two goblins riding worgs come out of the stables on the far side of the fort, and the manticore comes out to provide some air cover. (But, Jorr, who is "covering their backs" at the entrance (since he wasn't very strong and I didn't want to deal with him much), immediately nails the manticore *twice*, including one crit!). Zehra's turn comes around, and her player asks "OK quick vote, should I follow him up the stairs?". I interrupt him and say "No time for a vote. What do you do?" Zehra charges up the stairs but comes up short of Koth, so casts Command on him, but he makes his save. Koth then pulls out a small glass rod, rubs it on his fur, and blasts Zehra with a lightning bolt. Zehra lays on hands herself. Koth pauses for a moment, trying to decide whether to attack again or run, and Zehra tells Koth that she will destroy him. Koth makes up his mind and blasts her again, and she retreats back down the stairs with 2 HP, while Koth uses his last 3rd+ level slot to cast fly, drops out the window, drinks of potion of invisibility, and leaves. Meanwhile a pretty brutal fight is going on downstairs. I've forgotten a bunch of details, but Aideen was pretty badly injured by the manticore and the goblin worg rider, and knocked down by the worg. So she triggered her phoenix mantle ability, which sets herself on fire, and kills the worg and nearly kills the rider with a burning hands. The rider then gets himself killed by fire damage attacking her. The party mops up the hobgoblins, the manticore decides to flee but is brought down by a fire bolt, and the remaining worg rider decides it is time to go. The first order of business was quickly making sure the premises were cleared, before any buffs wore off. That complete, the party set out to do a proper search. The base of the tower attached to the barracks---Koth's bedroom, was filled with papers that Koth did not have time to collect, but they were written in Abyssal, so no dice. Cora searches around and finds a trap door to a vault, where they find the body of Amery Vrath, and a number of locked chests. Cora picked two of them, and Aideen destroyed one of them with some clever magic idea that I've forgotten, giving the party a whole bunch of loot detailed under miscellany. Further exploring the keep, the party finds a room with a a huge map pinned to a table, and I give them a handout for the map. It is a slightly inaccurate map of the Vale, covered with markings in Goblin detailing timetables and routes. Zehra looks at it and says "there is an army coming." The party then goes to interrogate the surviving hobgoblin soldier. Zehra nails an intimidate role, and he starts spilling, though he's cocky at first. Hobgoblin: "The Red Hand is the hand that comes in the night and smothers the babe in his cradle. It is the scourge that will scour the Vale, leaving behind nothing but destruction." Cora: "So it's an army." He spilled details about the timetable (the army departs on day 7) and numbers (thousands of hobgoblins, with a few dragons and a lot of monsters). Zehra asks "if I told you that it was the only way you would get out of here alive, what information would you have for me?" The hobgoblin asks if Zehra is telling him that, and I ask for a deception roll, since Zehra didn't seem like the sort to take prisoners if it was going to be a big hassle. Zehra hits the roll, and the hobgoblin reveals that the dragon Ozyrandian is holding the Skull Gorge Bridge until the Hand passes. Then the question came of what to actually do with the prisoner. Hoss pointedly left the room. Cora opined something along the lines of "This is a war, right? And he's a prisoner. We can't just kill him. That's a war crime or something." Zehra told her "You're going to be disappointed then." The hobgoblin, figuring a desperate shot was better than nothing, made a break for the door and got immediately felled by an arrow from Jorr. It was getting late, but I asked for quick ideas about what their plans were, and the leading idea, proposed but Zehra, was to send Jorr back to Drellin's Ferry to warn them while they go and destroy Skull Gorge Bridge. - "Which wood?" "The witch wood." "Can we stop this bit?" - Zehra and Aideen took a watch shift together, and I asked what they talked about. Zehra said "how we will murder Jorr if he betrays us", which, all right. - Cora was again annoyed about the ferry (and lack of a bridge) when they had to pay to cross. I described the other passengers, which included a cart of produce. Her player, thinking of Avatar: The Last Airbender, suggested it should be carrying cabbages. In the middle of a rewatch myself, I enthusiastically said yes. - I warned the party that complaining about transit infrastructure is a great way to tempt me into letting the game become Logistics and Dragons :P.
- Deed to Vraath Keep, deeded to "the bearer"
- Timing in this game is rough. My traditional time slot for games was always 6 PM on Saturdays, which is both earlier and has a lot more flexibility to run late than on Wednesday nights. We ran until 11:30 for this game, which is honestly not bad for me (I usually work around 10-6 with basically no commute), but is rough for many of my players. - I was kind of happy that I rolled no random encounters and the party avoided the hydra, since it meant getting to Vraath Keep and clearing it this session, which I didn't really expect to do. But I'm torn about this---obviously I could have just decided to cut those encounters, but I don't *want* the campaign to just be the big RHoD set pieces. - I've been happy with most of the players' RP, who have been doing a pretty good job finding their characters. I wish I was doing a better job in this journal making that come out. - Salen is a little quiet. I should try to find a way to get him some spotlight. - Zehra (the character) is I think a little frustrated at her lack of killing blows on significant opponents. - My second ever PC killed while I GMd was inflicted by Karkilan, the Vraath Keep minotaur, but he was approximately irrelevant in this fight. - Koth could have probably snuck into the map room and stolen the map after he made his escape from the tower, or at least set it on fire to keep the party from getting it. IRL a big reason he didn't is because I forget where the map was, but I guess in universe he's a bit of a coward. - I wasn't surprised by the party killing the hobgoblin captive. I'm pleased that it caused some arguing---I love intra-party disagreements. - I'm trying to decide if I should award the party enough XP to level before the next session. They are probably hitting Skull Gorge next session, and the extra level would be good. I know my party was 6 before Skull Gorge, but we also had two encounter in between the ambush and Vraath Keep. - Maybe it was because it was getting so late, but I had hoped for more of an impact on the party of the Red Hand's arrival. They were pretty down to business about it. We didn't have a game this most recent week because Hoss's player and I were out of town seeing the Ph.D. thesis defenses of two friends (and former players!) of mine. We'll be playing this Wednesday, though we'll be missing Hoss. Last edited by msully4321; 2018-10-24 at 10:17 AM. ...I'm glad that the Ghostlord no longer takes damage from Heal, but that Staff of Life is going to make them unkillable when it counts, even if it doesn't recharge. I'm not too worried about it, I think. I expect 5 of the charges will probably go to a resurrection, and so that only leaves 2 heals for clutch moments. The party destroyed Skull Gorge Bridge tonight! Details to come. I need to start writing this faster after sessions, since I forget a lot, though I'm not totally sure it is going to happen during the next week or two. Hoss's player was in France or something, so as part of my new quorum policy, we had Zehra's player drive him for the session. Action picked up just after Jorr had killed the hobgoblin prisonor, with the party planning what to do next. Zehra felt strongly that the best move was to destroy Skull Gorge Bridge, and managed to carry the day, despite some misgivings that the party might not be able to handle a dragon. The party was curious how the party would fair against a dragon. They decide that's worth at least scoping out, and resolve to head Skull Gorge Bridge, sending Jorr back to town with a warning of what is coming. The bridge was 19 miles away, meaning they needed to rest at least once on the way. They wisely decided to do that early, to recover from the fight. The party decides that the best bet is to avoid them. This unfortunately costs them about an hour of bushwhacking around the path, though that was not too bad a price for avoiding a random encounter fight, and in any case Hoss is a pretty good bushwhacker. With the intel in hand, they set to trying to come up with a plan. They considered some sort of flanking maneuver, but decided it wouldn't help much and they would have trouble crossing anyways. They considered trying to draw the defenders into the forest and fighting them there (which wouldn't have worked; they defenders would have held position). They then really seriously considered the most-likely-to-lead-to-a-TPK plan I've ever heard as a GM, which was to charge up, force their way into one of the guard towers, and then kill all the bridge defenders as they try to retake the tower. They ended up deciding against that---I can't remember exactly why, but it was for some reason other than "we will get trapped in the tower where we can be killed at the dragon's leisure by his breath weapon," and settling on the more straightforward plan of running in and brawling outrageous. Ranged combatants held back a bit, while Zehra charged right ahead. Zehra fought with the hell hound, which dropped relatively quickly, while the rest of the party fired at the hell hound and archers. Ozyrandian, the dragon, launched from his resting place and curved around to engage the party---a somewhat hokey meta strategy to ensure that he wouldn't come into easy range until the turn he attacked. Ozy closed in and dropped a poison gas cloud, which immediately dropped Salen and Aideen and badly hurt Cora. Cora went and poured a potion down Salen's throat, and then Aideen's player realized that she had forgotten to add her prof bonus to her save. Oops. I was nice about it, and things looked a lot less dire. I've forgotten some of the details of the battle, but the hell hound dropped quickly, and people kept loading damage onto Ozy. Zehra started crossing the bridge, only to have Ozyrandian swoop down and attack with a bite, a claw, and---most frighteningly---a shove. Fortunately for Zehra, she managed to keep on her feet, but was pretty spooked and braved an attack of opportunity to finish crossing the bridge. At this point, Ozy was pretty spooked, so he retreated, drank a potion of invisibility, and then a healing potion or two, while Zehra single-handedly bottlenecked 5 hobgoblins on the bridge and the rest of the party exchanged fire with archers. Of course, Ozy wasn't going anywhere quite yet, and invisibly crossed the gorge again to drop another breath weapon. Visible again, and still relatively badly hurt, Ozyrandian was quickly felled by the concentrated fire of the bulk of the party, while Zehra prevented any hobgoblins from closing in to cause trouble. After that it was all mop-up work. The party searched the bodies and the encampment, and then Aideen lit all the buildings on fire. This was not a good idea---the smoke would be visible from Cinder Hill---and I should have had a response team of manticores arrive before they finished the job of destroying the bridge. But I didn't, and, taking turns with a pick-axe, the party managed to do enough damage to the bridge that it catastrophically failed. But not before Zehra left a note, in draconic, reading: "<3 Zehra and the Blue Hand Group". * Aideen: "I feel like this is a dumb plan." Hoss (via Zehra's player): "There's no plan. It can't be dumb yet." * Aideen: "Zehra should go prone so she can't get shoved off." Me: "That sounds like an Aideen plan, not a Zehra plan." * I suggested they come up with a party name a few weeks ago. The "Blue Hand Group", Aideen's suggestion, was what they settled. Zehra suggested a bunch of names that all began with "Zehra's", which was a nonstarter for most of the party. * So far every day has been a one encounter day. * Zehra's player mentioned that he figured that destroying the bridge would slow the Red Hand down by several weeks, since armies are hard to move. He was disappointed when I said it would probably only be a few days. He isn't necessarily wrong, but they don't need to go *that* far out of their way, and probably already had a contingency plan for it? In any case, the module calls for a three day delay and the timeline is already likely to be pretty generous. * They never seriously considered any covert approaches to destroying the bridge. The last time I GMd this, the party druid wild-shaped into a bird and then used a scroll of Stone Shape that they had purchased in town to destroy the bridge (or something like that). That wouldn't have worked directly here, but maybe something could have been come up with. * Spending an hour trying to make a plan and then launching a frontal assault is basically what Imsril & co. did when I played in kjones' game a decade ago. We met up the other night for session number 4. I had thought that we had a full crew for it, but found out as people were trickling in that Aideen's player couldn't make it and Zehra's player would be covering for her. We picked up right where we left off last time, late in the afternoon of July 4, after the party had destroyed Skull Gorge bridge. Injured and low on resources, they bushwhacked a half mile into the woods and made camp for the night, which passed without incident. The first order of business in the morning was figuring out the route the party was taking. Hoss pointed out that he has a class feature that means he can lead a party through his favored terrain without ever getting lost and can ignore difficult terrain. Which, damn, they can just cut a straight line across the forest? I said that this would probably triple their chance of random encounter or so, which was kind of because I wanted them to go past the giant territorial marker effigy. I had forgotten to mention it when they went past it the last time, and I wanted them to get the chance to meet Old Warkelgnaw the forest giant. I feel kind of bad about how I handled this. So the party decides to follow the road, largely because Zehra kind of just doesn't believe that it wouldn't be slower to cut through the woods. They also decide to march as quickly as they can: a fast march could get them back the 33 miles to town (with just a little forced march) in one day. After a few miles, they come across a giant-sized effigy. Cora's player wants to know if it looks like a shrine---no. Hoss's player asks how long ago the battle with the giants was---150 years, but giants can live to 200. Despite that, the party decides they don't have any time to investigate, though Hoss makes a note to come back later some day. Of course, Old Warkelgnaw will be long dead by then---he's sick and won't survive another winter, and will make sure to go out in a blaze of glory. Feeling that the most important thing was to get back to town as quickly as possible, they decide to move quickly--allowing them to cover 30mi/day but with a -5 penalty to passive perception checks. That is a pretty nasty penalty, and directly leads to a Girallon getting the drop on the party. It drops out of the trees and surprises the party, viciously tearing into Cora with a bite attack and four (!) claw attacks, almost dropping her. Unfortunately for the Girallon, she beat him in the initiative order and was able to fall back, so he didn't have a chance to finish her off and carry her away as dinner. The party blasts away at the girallon for a couple rounds before it escapes into the woods with 2 HP (and I discover that at least one player wasn't familiar with the Disengage action! oops.). Continuing to move on, after a couple more hours, the party entered a swampy section of flooded forest crossed by a wooden causeway. A hydra lurked under an overturned wagon, but it rolled true garbage on its Stealth roll and so even with a -5 penalty, Cora easily spotted it. I described her seeing two hydra heads poking out of the water, one looking at her, and then the heads quickly darting underwater. The party decided that they did *not* have time for this, and so backtracked, cutting along the path of a creek and returning to the Witch Trail that they original took into the forest, getting back to town after a short forced march pushed them the last few miles. When they get into sight of town, they spot watchtowers being built on the eastern bank of the Elsir River. "That's good," says Cora, but Zehra disagrees: "It's not. They need to be evacuating." "At least they're doing *something*." The party heads straight for Town Speaker Norro Winston's house, who quickly makes time to see them. He heard Jorr's report, but he is still skeptical that there are really *thousands* of hobgoblins coming. Hoss tells him: "I don't know how many hobgoblins it is going to take to sack this town, but I know how many they are going to use." Norro remains skeptical, though: *do* they really know how many are coming? "It could be much fewer! All we have is the word of a hobgoblin you tortured." "We didn't torture him." "... nevertheless." Norro still holds out some hope for fighting, but Cora (I think) points out that there aren't any walls in the city. Norro says the could build some, but they would be be wooden palisades. In the middle of the meeting, Hoss's player looks up at me and says "Dude, Sully, this is really dark." Yeah, man, it is. In the end, the Speaker says that a final decision needs to wait for a town council meeting tomorrow, the councile being him, captain of the guard Sorranah Anita, Delora Zann, proprietor of the Old Bridge Inn Kellin Shadowbanks, and Iormel, a wealthy landowner who they don't know. Next up, the party goes to speak with "that retired adventurer", Delora Zann. They walk in and Zehra says "There's a hobgoblin army coming to destroy the town. ", and Delora, to their relief, tells them "Yeah, Jorr already told me. We need to evacuate the town. There's nothing defensible between here and Brindol, and even the walls there aren't in great shape." The meeting then turned into a discussion of tactics. Delora mentioned that Lord Jarmaath of Brindol would start reinforcing the walls as soon as he found out about the invasion. Cora asks Delora if she knows Lord Jarmaath. "Do you know him?" "... yes.." "So, uh. Good ex or bad ex?" "We adventured together, some time ago." "... so bad ex." "He was bitten in the rear by a dragon we fought, and I may have given him a hard time about it. I'm sure it will be fine, though." Delora gave the party a hard time for not getting a first hand report on the size and force disposition of the Red Hand, and they agree to ask Jorr to return to the Witchwood and scout it out. That will take at least three days, though, and they all agree they want the evacuation to be starting before then. They head back to the Old Bridge Inn and Cora is more than a little disappointed to find that her halfling countryman, Kellin Shadowbanks, isn't convinced about the need to evacuate. He wants to try paying the Danegeld and bribing the Red Hand to leave them alone. Iormel's got plenty of wealth they could expropriate to pay it with, too! That doesn't lead anywhere useful, and the party turns in for the night. Fortunately, Salen has had an idea for dealing with the lack of intel! The Divination spell, from the cleric spell list, should let him ask his god for information about the army that is attacking. The only catch is it is a level too high for him to cast, but they manage to buy a scroll of it from Sertieren the Wise, who normally doesn't have cleric spells but managed to pick one up in a firesale. The spell components are incense and a sacrifice. Wee Jas is a death god, so Salen figures an animal sacrifice is the way to go. He says he spends 25gp on a goat, and I tell him that goats are way cheaper than that. But the spell component is 25gp of incense and sacrifice combined, so they get 23gp worth of incense. Since it is casting from a scroll at a higher level, he's got to make a spellcasting ability check, which he rolls a one on. So the party sheepishly returns to Sertieren to see if he has anymore, which I kindly say that he does. After purchasing another goat ("Whatever, you don't need a new goat." "No, dude, the goat is gone. "), Salen manages to cast the spell, and asks how many hobgoblins, dragons, and minotaurs are in the army about to depart Cinder Hill. Somebody reminds him that he probably means manticores, so he adds that to the list as well. Three thousand hobgoblins, two dragons, zero minotaurs, twenty-four manticores, ... and twenty-five undead. I resolved the town council meeting without busting out any dice, because I felt like the party was persuasive, and the divinely inspired testimony from Salen was hard to argue with. Iormel wanted to stand and fight, but that idea was shot down pretty quickly once the size of threat became clear. Kellin argued for a long time with the party about the idea of trying to bribe the horde, which Norro was sympathetic to, but eventually mostly talked out of by the party. A lack of volunteers to be envoy was a major problem with that plan---Kellin certainly wasn't signing up! In the end, the town council agreed to evacuate the town, though they want to cut it close on the timing, so they can bring in as much of the harvest as they can. They spend the rest of the day, July 6, doing a day trip out into the Witch Wood and tearing up the Dawn Way to make it harder to pass. I'm not sure if one day spent doing with with just 5 people is enough to earn the party any Victory Points for the calculation at the end? Maybe a fractional point. They spend the night in the Old Bridge Inn. Somebody (Cora?) asks if they have comped rooms because they are heroes now. Sure, why not. Partway through the night, though, the part is woken by shouts from the street: "Alarm! Alarm! Goblins attacking the west bank!" * The party keeps mishearing "Norro" as "Nora". Norro: "Ugh, Iormel's gonna say I told you so, but it actually is a good thing that we didn't repair the bridge." Cora: "I know. It's the *worst*." Zehra: "If you had rebuilt the bridge, we would be tearing it down tomorrow. Zehra's player: I'm on 9. Zehra's gonna stay on her horse, and..
Me: Do you know the mounted combat rules? Zehra's player: Zehra gets off her horse. * The party spent a bunch of time trying to figure out how to use Sending to warn Brindol. They feared coming across like a spam email. * "You have the word of my god, you can't win this fight." * "Nevertheless, I am staying with my town." * "Then you will meet her soon." * "I've managed to outrun her so far." This was *totally* unecessary antagonization of a party ally, but some fantastic creepiness from an acolyte of a death god! * I thought this was a great session! I loved the town interactions, I think that everybody is getting a feel for their character and getting some good RP in, and I think it has sunk in how rough everything is. * I'm a little disappointed that the party didn't get to meet Old Warkelgnaw, since I love doing my Warkelgnaw voice. And convincing Warkelgnaw to help fight the Red Hand would delay them by two days, which is a big help. Maybe I should have been a bit more proactive in pointing out that they recognize the effigy as a territory marker (or called for intelligence checks to do so), but I also want to give them a lot of space to decide what they think is important---which, hopefully, will include some stuff that was not in the module and will need me to do some improv work (which is a huge part of my normal modus operendi when I'm running homebrew games)! * They are going to be *so mad* to have to sit on the ferry for six minutes as they go to fight the raid on the west bank! Next session is tomorrow, and so it is now extremely pressing that I figure out what I am going to do about Rhest. I think the lead about the blockades is pretty good as a start, but doesn't give a clear reason to go into the Blackfens? Last edited by msully4321; 2018-11-14 at 01:00 AM. Blockades with a red hand on them, that weren't constructed overnight? Attack by a feral razorspawn from the fens? Local rumors of a dragon in the swamp that might be bribed to stay out of the fight, or killed before it starts unloading on civilians? I need to get me a copy! Session 5 was the first session to be scheduled in a consecutive week, and we had the full gang in attendance again! This going to be a kind of bad summary, since I wrote it over like three weeks and forgot a ton. Unfortunately it turns out that the biggest motivation for me to finish a summary is to have it done before the next game, and between thanksgiving and work travel and stuff, we've missed three weeks in a row. The session began with the party waking up to shouts of a goblin raid on the far bank of the river. Without a moment's hesitation, Zehra jumped out of bed and... started putting on her armor, barking orders for someone to help her. Cora stood on a chair and helped out, and when the armor was about half on, a guard showed up at the front door and told the party to hurry up and get down to the ferry! It'll take a while to cross anyways. After some groans, the party departed half clothed and made it to the ferry. Captain Sorranah Anita had formed up a unit of militia and was almost ready to start moving, but wanted a bit stronger of a force before she left. Delora Zann, the retired adventurer, was already there, standing on shore and smoking a cigarette. Shortly after the party arrived, the one other person Sorranah had tried to fetch arrived: the town wizard Serteiren the Wise, cutting an impressive figure as a 2 foot 6 halfling still in his pajamas and wearing a large floppy hat. Aideen spends most of the boat ride gazing off into the flames. Captain Anita explains that the plan is to split into teams, with the Blue Hand Group going one way and everyone else another. This is a plausible tactic, I suppose, but also rather transparently just reducing the scope of a battle to simplify things. She tells Serteiren that he is on counterspelling duty, if they run into any casters. As the boat gets within bowshot range, Hoss raises his bow to start taking shots at sillouetes against the flames, but Delora stays his hand and tells him "They don't know we're here, yet." Disappointed, Hoss lowers his bow. On landing, the party splits off from the NPC cohort and is quickly engaged with a group of goblins riding worgs. They dispatched them with frustratingly little trouble, and I remember basically nothing about it. The party quickly paused to search some of the burning houses near them for survivors, and as they started doing that came under attack from a squadron of hobgoblin soldiers. Some manuevering ensues, and Hoss looks around the corner and spots four (!) Hobgoblin sorcerers closing in... all placed in one square. It was one dude who had cast Mirror Image, but Hoss didn't realize that, and panicked a bit, spending a whole turn retreating, which caused some trouble for the party. Things were a bit dicey for a moment---fireballs are dangerous!---but the party managed to mop up all of the soldiers, at which point the sorcerer decided it was time for him to cast invisibility and get gone. I honestly can't remember if anything important happened after the fight. I think they spent some time discussing strategies for delaying the horde. * Zehra had a lot of kills stolen from her. * The module doesn't call for Serteiren the Wise to come across, but I figured that the defenders would want any edge they can get, and it provides a good explanation for how militia soldiers could survive an encounter with a Hobgoblin Devestator. I've been really happy with this campaign so far and am happy with how everybody seems to be starting to find their character. We're not here to tell the story of REDACTED PLAYER NAMES saving the Vale, we're here to tell the story of Zehra, Cora, Aideen, Hoss, and Salen saving the Vale! This means that the *characters* need to be working together to make plans, strategize, etc. There are a couple implications of this. 1. Some of your characters probably have very different problem-solving approaches than you do! We're all nerdy engineers, but your characters are all badass adventurers! 2. This is a big opportunity for exploring intra-party interactions and relationships, since your characters need to be working together and debating and arguing to figure out what they are doing! And in general, I really encourage exploring intra-party relationships! Feel encouraged (in an bonus XP kind of sense) to have in-character side conversations, etc. * At one point the party was discussing future plans with Delora, and made a point of mentioning that there is something labelled "Ghostlord", which can't possibly be good. Delora also pointed out "Sarviith", to the north, in an attempt to lay some ground work for heading to the swamps. Last edited by msully4321; 2018-12-11 at 03:38 AM. ...Assuming they remembered what they intended to do. Last edited by Fable Wright; 2018-12-12 at 11:29 PM. I'm surely going to be keeping an eye on this! Thanks! We managed to run a game again! Unfortunately Cora couldn't make it, and there were some traffic disasters that resulted in Hoss and Aideen being like 30 minutes late. I decided that my plan for providing a good hook to go to Rhest was to just hand it to the party on the platter: Jorr was out scouting, and I decided he would take a goblin prisoner who was being sent to Rhest and knew that the Hand was raising an army there, but that there was something off and creepy about it. Jorr would get back on July 8 from his scouting, as determined previously. The session picked up on July 7, just after a Red Hand raid on the west bank of the Elsir River. The Blue Hand Group decided to restart their long rest, but set up camp in a warehouse on the west bank, in case there was more to do. The agreement with the town leadership was that the evacuation would start on July 10, so the party had a few more days where they could use Drellin's Ferry as a base. Lacking any obvious next steps (Teyani Suri hadn't arrived yet bearing news of the roadblocks, and Jorr was still out scouting), the party had to figure out something on their own. This took a while, and didn't go super great. Aideen wanted to go back into the Witchwood and try to root out any hobgoblin vanguard there, in the hopes of preventing more raids. Zehra wanted to travel east and look for hobgoblins that might threaten the roads to Brindol. They argued for a long time, both seeming to thing that the other's plan made no sense at all. Salen then made a counterproposal: to head south to investigated an ominous label on the Red Hand's map: "Ghostlord". Salen, of course, was mostly motivated by his religious order's opposition to most forms of undead. The rest of the party ended up agreeing, mostly as an end to the argument. Of course, this plan was definitely worse than either of the other plans: looking for Red Hand patrols in either direction was definitely a marginal plan, and it could produce marginal gains. Heading to look for the Ghostlord without any knowledge or preparation is at best at waste of time and at worst suicide. They ask Delora Zann for some horses to borrow, and despite some skepticism about their plan, she agreed, but told them "Make sure to bring them all back. We need horses for the journey east." The party departed Drellin's Ferry late on July 7 (because of the nap they took), and arrived at the edge of the Thornwaste just after sunset, but with several hours more of travel possible, if they made their own light. The Thornwaste is a broken and hard to navigate landscape, filled with gorges and escarpments, briars clogging every route that would otherwise be navigable. The party argues about what to do for a while. Salen suggests setting it on fire. Aideen immediately launches a fire bolt or two into the wastes, sparking a small wildfire. Hoss and Zehra were somewhat upset by this, so Aideen put it out with Control Fire. The party argues some more, and then decides to push on into the Thornwaste. They make it a few miles, and their horses are lamed by the thorns. They leave the Thornwaste and camp out, I think agreeing to not listen to Salen in the future :P. They lit a fire, hoping to attract attention maybe. During the night, they spotted two lions stalking the outside of the camp, but otherwise no incident. 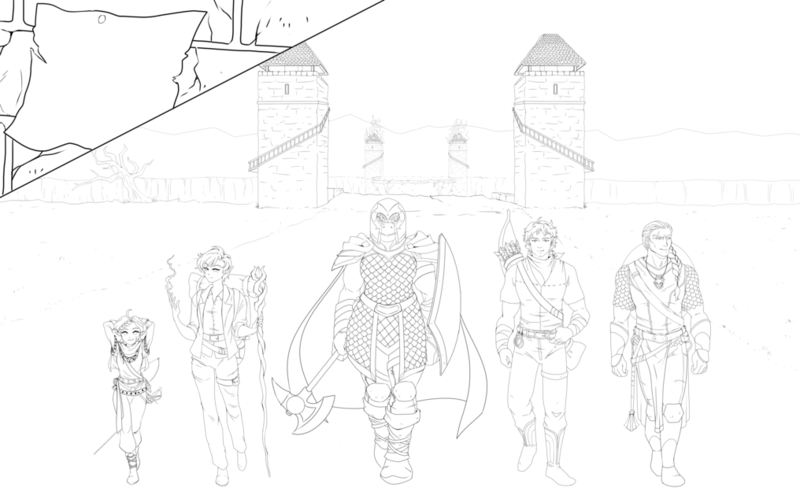 The party argued a bunch more and then decided to try out Zehra's plan of searching east along the Dawn Road. After traveling for several hours, they find signs of an ambush, two days old. They follow the the tracks for several hours, and then the sun sets with them in the middle of the vale---"I'm not sure what we expected," says Hoss. I feel bad about this one---I could have easily made this have been more useful, leading directly to a camp. The next day they head back to the road, find some more signs of attacks a few days old, and then give up and head back to Drellin's Ferry. Well, great. We've successfully killed some time until an obvious next step was available, but it wasn't really fun for any of the players. On the way back to town, they run into a group of early refugees that decided to split before the official departure. One of them mentions a chimera attacking the town (Delora, Jorr, Sorranah, and some of the militia drove it off), which freaks Hoss out a little bit. Salen says something creepy about death (a theme) to the fleeing merchants, and one of them recognizes Salen from when he was back in Nexus---"too weird for the temple of Wee Jas!" was his takeaway. On getting back to town, the party heads over to Delora's livery stable to return the horses, and find her playing cards with Jorr and Sorranah. Delora is ahead, and Hoss and Aideen ask to be dealt in while they talk. Jorr gives a report of his scouting: three thousand odd hobgoblins, contingents of goblins on worgs, a large red dragon, some manticores, and contingents of ogres and hill giants, as well as some stuff he wasn't sure about. Then the kicker: he saw a detachment of goblins headed north, and grabbed one when he slipped out of camp to use the bathroom (Hoss: "he seems better at this than we are."). From that, Jorr discovered that some sort of army was being raised in the Blackfen Swamps, near the ruined city of Rhest. Although it wasn't clear what it was exactly, apparently there were weird and creepy rumors about it inside the Hand. Salen asks if there is a a corpse he can cast Speak With Dead on. Some other party members roll their eyes, until Jorr pulls a head out of his bag. Ew. The head doesn't really have any information that hadn't already been shared. As the conversation wraps up, Jorr wins a big hand, but slides the money over to Delora. "I'm headin' back to my cabin 'cause I'll die before I let some hobbos waltz through my woods without a fight. Probly won't be needing the money after that." With the evacuation train about to depart the next morning, the Blue Hand Group sets up camp at the edge of town, with the wagon camp. As they get ready for sleep, a rider approaches: Teyani Suri, a member of the elite Lions of Brindol, carrying messages of a blockade to the north. The party---and Teyani---are worried when she had not heard the news of the Red Hand while on the road, and she requisitions a fresh horse and gallops bast East, in case other messengers were waylaid. The party departed the next morning and the trip across the Vale passed basically without incident. There were a couple good scenes discussing the four little towns they went through and the conversations they had with leaders. Talar was governed by a former adventurer who took over when her father died; she made some side remarks to the party about how much easier it will be to replace the difficult town council if she gets Talar through this. In Witchcross ("which cross? "), the party asked to meet with the Council of Elders, who---as soon as it became clear this was Serious Business---paused the meeting and called in the druids who *actually* run the town. After the druids said their piece, the head Elder started repeating it, but the party was done listening (Aideen: "these guys are the worst"). * I personally kind of love running sessions where the characters just argue the whole time without any input from me. One of my proudest moments as a GM was provoking a 45 minute argument on political theory in a Fate game set in the early 1800s by compelling a character's "Death to the aristos!" aspect. But it requires the players to be into it, and the party mostly seemed frustrated. * Though I do kind of like Zehra and Aideen being at odds! * There have been a lot of good interactions with Delora Zann, the retired adventurer, a bunch of which aren't recounted here. She is one of my favorite NPCs in the game, so I've given here a lot of screen time. * I should have cut them some slack and had an encounter during their wandering, or had them find something better. I played it straight by the random encounter tables, basically, but that was a choice I didn't need to make. Last edited by msully4321; 2018-12-28 at 01:04 AM. This session, the first after the holidays, featured Hoss's player missing while still visiting his family. He didn't send anyone a character sheet, so Zehra's player just kind of winged it. This post is deeply late, since I got sick after it (and had to cancel a session that all five players could make :( ) and then was travelling and also I am a bum. I didn't have it up before I had to run another session, despite going three weeks between sessions. Oops. After some quick deliberation, the party basically just charged into the fight. The defenders were two ogres, two hobgoblin sergeants, and six hobgoblin regulars, with a couple regulars visible on the wall of the blockade. The ogres threw boulders from behind the wall (which is an upgrade from base ogre stats, but it is what kjones did when I played; I used some toned down version of the hill giant rock throwing). The ogres did a bunch of damage, as did the sergeants, but the hobgoblin regulars were just a total waste of time. Zehra got dropped by one of the sergeants after having busted open the door of the blockade, but Salen healed her right away and things never looked particular dire. The party then used Speak with Dead to interrogate one of the corpses, and found out that Sarviith had a small number of men with him (less than thirty) but were trying to raise an army somehow? After camping out in the barricade for a long rest, Aideen set fire to it and they kept heading North, looking for the Red Hand presence in the Blackfens. Then, after about a day's march up the road through the marsh (which was often a causeway surrounded by water), the party spotted a little hillock off the road with a dead giant owl on it, that looked like it had been ripped apart and dissolved in acid. Before the party had much time to react, though, they were suddenly ambushed by a wicked looking green scaled create with sharpened wings. The greenspawn razorfiend sprayed its acid breath on three party members, which also kills two of the horses. It then bounds away, but Zehra chases after it on her horse, and there is a little bit more fighting before the Razorfiend succesfully escapes at low hit points. After driving off the razorfiend, the party sits down so that Salen could cast prayer of healing, but while they waited for that, five armed wild elves riding giant owls appear, circle several times, and landed near the dead owl. They inspected the body and quickly identified it as belonging to their tribe. Their leader then introduced himself as Kiliar Arrowswift, of the Tiri Kitor elves. He asked for an accounting of what happened, and was rather suspicious, and told them to come with him to speak to their leaders for an investigation. This led to to something of a standoff, with Aideen's position being "We are just travelling down this road, you can't threaten us like this" and Kiliar's position being "This is our marsh, and my missing soldier's owl is lying dead fifty feet from us." Aideen pointed out that the owl was killed with acid, which they couldn't have done, and Kiliar said that wizards can make acid! Aideen retorted "Really? I'm not very well educated." which Kiliar did not have a great response to. Aideen got somewhat frustrated and said that lots of people came through this road, and they don't deserve to be hassled like this. At this, Kiliar got somewhat mad and shouted that most people aren't found next to his dead friend. After a bit more back and forth, it was agreed by everyone that the party were probably not actually suspects but maybe it would be a good idea to go quietly anyway. With five giant owls, each character hops on an owl with one of the elves. Zehra hoped on Kiliar's owl and immediatly asks if he has ever killed anyone ("Yes." "How many?" "I stopped counting after five."). Aideen with flies with "whoever is cutest". After an hour or so of flight, the party reaches Starsong Hill, the main Tiri Kitor encampement, a low hill in the marsh covered with tree houses and illuminated by lanterns filled with fireflies. The party was taken to talk to the Tiri Kitor's leader, Speaker Sellyria Starsinger, an ancient druid, and to High Singer Trellara Nightshadow, a young bard and the sister of the scout who had been eaten by a razorfiend (Lannikar). They tell Sellyria what happened in the marsh, and also about the Red Hand. Sellyria believes them, and gently chides Killiar for his unnecessary suspicion. Sellyria lets the party know that a goblin, a black dragon, and a small cadre of hobgoblins had taken over the ruins of the sunken city of Rhest. The Blue Hand Group tells Sellyria that they are going to head to Rhest to deal with the Red Hand there, and Trellara, who has been mostly silent, volunteers to guide the party to Rhest, to avenge her brother. Before they can leave, though, Trellara needs to perform at her brother's funeral. Aideen, an accomplished violnist, offers to accompany her, and they spend much of the day practicing. Zehra, meanwhile, asks Killiar to spar with her, and then Killiar teaches Zehra how to fly an owl. Salen and Hoss go help tend to the sick and wounded at the temple while the high priest is out of town. All things considered, the party is rapidly impressing the key NPCs in town and almost certainly are going to get loaned Giant Owls. Aideen hits a 25 on the perform check at the funeral, so her and Trellara really impress the heck out of everyone. The post-funeral festivities involved a lot of drinking, so the Blue Hand Group settles in to enjoy the party, preparing to depart on July 17. * While teaching her to fly, Killiar tells Zehra that up on his owl is his favorite place in the world. Zehra tells him "my favorite place is on solid ground, defeating my enemies." * While talking to Sellyria, Salen offered to officiate the funeral. Sellyria told him that the Tiri Kitor high priest would perform the ceremony, but she would appreciate if Salen gave a blessing. Cora interjected "I wouldn't be sure about that. He serves a really creepy god. ", but Sellyria responded with something like "It is natural to fear death, and so of course natural to be discomfited by the clergy of a death god. But death comes for us all, and when it does, the blessing of a death god must surely be valuable," which prompted a "Damn, I just got schooled" from Cora's player. * Man the Tiri Kitor's names are silly. Kiliar's title is *battlehunter*. Good god. * I think everyone found it a little hard to take some of the Starsong Hill stuff seriously because of how silly all the names are. Maybe I should have tweaked it. I think people came around and ended up basically liking it. * I had the razorfiend encounter happen while the party was still on the road instead of once they were in the marsh, which I think is what led to a bunch of the tension, since Aideen felt like they were in neutral territory. * With very little prompting from the module, every campaign of RHoD I've been involved with has performed at or after the funeral in some way. Aideen's player was surprised when I mentioned this. * This post is being posted after I ran another session and know that I am right, but I wrote this observation before: I'd be kind of surprised if Aideen doesn't fall for Trellara Nightshadow. * Why can't I stay consistent about whether I'm using past or present tense? I'm not really sure which works better for this. This session we had everybody but Hoss, who bailed at the last minute because a friend was in town. Oh well. They went to the sunken city of Rhest, and it was pretty baller. The Blue Hand group and and Trellara Nightshadow headed north through the Blackfens marsh, and after six hours of travel, reached the mid-sized lake that covers the sunken city of Rhest. The party hid their canoes while the sneaky adventurers crept up to the edge of the lake to see what was going on. Their scouting reveals that almost all of the former great city of Rhest is covered by a murky lake, with two notable buildings rising above the dark water: a tall bell tower and the former city hall, both of which have had rafts of wood lashed around them. Surrounding the edge of the lake are dotted a dozen or so clusters of huts, which the party correctly assumed belong to the lizardfolk. For reasons I don't quite remember, some members of the party decided it was important to talk to the lizardfolk first, and the rest went along. They paddled over to the nearest hut, and were annoyed to find it empty of inhabitants (40% chance per the module). The inside of the hut is pretty squalid, and contains a handful of trophies made from giant owls, which the party try to hide in vain from Trellara ("Please, I know they hunt our owls."). They then argue about what to do next for a while, though after somebody suggests starting a fire to attract lizardfolk attention, Aideen has difficulty paying attention to any other proposals. They eventually do that, Aideen dancing through the swampy grass magically inciting it to burn, and two rafts of lizardfolk approach. A tense negotiation ensues, in which the party succesfully extracts some information on the disposition of forces, learns that the dragon, Regiarix, is the lizardfolk's god, and then Zehra roars, walks out onto the water (Salen had been ritual casting water walk all day) and informs the lizardfolk that they follow her now. She nails an intimdate roll, and the lizardfolk have been a little sour on Regiarix ever since Sarviith showed up, so a brief scuffle ensued, two lizardfolk were killed, one swam away, and the rest bowed down to Zehra. So invisible and water walking they approached the town hall, seeing a building rising about a story and a half above the water with ruined walls on the upper floor and 4 ogres standing guard. At this point, Salen deployed his masterstroke: Control Water. The water level quickly raised by 20 feet, causing two of the ogres to be washed out into the lake and two to be in waist deep water on the roof. Water started pouring down into a large hole on the roof. Zehra charged in and engaged with the ogres while the rest of the party engaged from a distance. The roof was hard to navigate because of the sucking of water into the building. Despite that, though, next round, a black dragon---Regiarix---carrying a goblin archer on its back---Sarviith---erupted from the roof. Sarviith took some potshots before Regiarix dove into the lake. The next round, Regiarix popped up again, dropped a wicked line of acid, and dove again, only to find himself exposed again as Salen parted the Red Sea and left him exposed! The rest of the right proceeded basically along those lines, with Regiarix trying to use the cover of the lake to reposition and Salen using control water to prevent it. Regiarix pulled distance to regroup and recharge his breath weapon (out of range of the lowered water level), and then erupted out from the wall of water, Sarviith blasting away with arrows. Immediately, though, Cora kills Sarviith with a sneak attack, describing it as shooting through his harness straps and him plummeting to the ground and snapping his neck. Regiarix, furious at the death of his friend, lands next to Cora and tears into her, but Cora calmly switches from her bow to her rapier and stabs him through the neck. How does Cora manage to get all the big kills in this adventure?? A bit more mop-up ensues, as the bell tower starts ringing and a razorfiend approaches from across a floating bridge, but with help from Salen's "curse" ability and some smites, Zehra deals like 70 damage to it in a round on top of someone else's previous attack, killing it in the first round. They then go to explore the ruined town hall, finding inside the corpse of an ettin and another hobgoblin, both drowned without being able to join the fight! In Sarviith's chamber they find an ominous find: a note from "Ulwai" entrusting Sarviith with the safekeeping of the Ghostlord's phylactery, which the Red Hand is apparently using to blackmail him to their cause! Then, excitingly, they find a very lucrative dragon horde, with a lot of money, a few magic items, and an object that could only be the ghostlord's phlactery! * Trellara cast Heroism on Aideen while singing to her (which was the verbal component), which led to the following exchange "Aideen, are you keeping track of the temporary hit points?" "..." "Or are you just happy the cute bard girl might be flirting with you?" "Basically that." * At one point, when the water was drained, Zehra shoved an ogre off the edge of the building, who then fell on Salen, who was hiding against the corner. * This party is very range combat heavy. The only character built around closing to melee range is Zehra. * The lizardfolk who escaped was supposed to warn the Red Hand, but during the long planning conversation that followed, I totally forgot. Oops! * This was a super fun fight, and Salen played it reaaaaly smart with control water. I love seeing casters take control of battles with clever uses of situational spells! * I think that their enemies need to play more hardball if anybody is going to die this campaign! And between the staff of life and a scroll of revivify, they've got a couple cheap deaths ahead of them, so I should push for it. * They have definitely earned enough alliance points with the Tiri Kitor to get giant owls. Sigh. There are downsides to giving them the owls, since they can move super fast now and it will be less plausible to be having random encounters crossing the Vale (though that probably won't stop me! ), but also having the owls is super sweet and they did I think earn them. Something awesome to read while plowing through the eternal hours at work! We had everybody but Cora for this game. This is a cliff-notes abbreviated recap so that I can clear the backlog before we play tomorrow (three weeks in a row! ), which will *probably* take the party back to the Thornwastes? * The party spent a lot of time discussing what to do regarding the Ghostlord. Eventually they decided they needed to go there and get him to not attack. Probably they will need to argue a ton more about the details. They're going to Brindol first to research where he is. * They found a stagnant pool that had some razorfiend eggs in it, though it was dark and they couldn't see how many. Zehra had one of her lizardfolk minions pull one out, and he cut himself on the sharp edges. Salen used control water, emptied the pool, and destroyed the thirty (!) eggs present. * On the way back to Starsong Hill, their boats were attacked by giant crocodiles. * They've been racking up "alliance points", so when they got back, Sellyria Starsinger committed Tiri Kitor forces to the defense of Brindol *and* offered the party owls. * There was a lot of celebrating their victory, and Trellara was making up and singing songs about the victory. Aideen was putting the moves on her some. * They make it to Brindol and meet with the leadership: Lord Jarmaath, High Priestess Tredora Goldenbrow, and Captain Lars Ulvirth. They tell them everything they know, and that they are going to go try to deal with the Red Hand. * They went and visited Immerstahl the Red, the best known wizard in town (he's 9th level!). They failed to answer any of his sphinx's riddles, but were able to enlist his help in researching the Ghostlord, which will happen next session. * "Do you know the difference between alligators and crocodiles?" "What? Uh, if you are asking Aideen, no. If you are asking *me*, ... also no." * Somebody suggested "who, what, where, why, and when" as the names of their owls. * Aideen got in an argument with Tredora Goldenbrow, the head cleric, over whether it was racist to call the Tiri Kitor "mud elves", which is term Cora's player made up at some point. * The party has plenty of schedule slack if they want to spend a couple days in Brindol, which I kind of hope they do. I need to figure out how I am going to stat out the Ghostlord. The 5e conversion guide just says to use a Lich from the MM, which is much too powerful. I think that it *should* be *possible* with solid planning and a bunch of luck for the party to kill the Ghostlord, even if trying is a bad idea. I don't think they could do that with a CR 21 Lich! (Though it *does* only have 135 HP...) I think it is unlikely they will make it to the Ghostlord himself next session, so we are good. Hey msully! I started reading your campaign journals the other day and love them! Keep 'em going! Love the details, also love the miscellany stuff. "Witchwood, which wood?" LOL! *snipped* I need to figure out how I am going to stat out the Ghostlord. The 5e conversion guide just says to use a Lich from the MM, which is much too powerful. I think that it *should* be *possible* with solid planning and a bunch of luck for the party to kill the Ghostlord, even if trying is a bad idea. I don't think they could do that with a CR 21 Lich! (Though it *does* only have 135 HP...) I think it is unlikely they will make it to the Ghostlord himself next session, so we are good. So I have had my parties face a Lich before, but nerfed him quite a bit. I honestly kept the HP at 135 because they could cut that down pretty quick anyway. I think the most important things you can do to lower CR in this case is remove certain spells (Power Word: Kill, Finger of Death, Disintegrate) and just essentially make him a few levels lower. Then perhaps throw in some undead lackys (zombies, ghouls, minotaur/ogre skeletons, etc.) and you've got yourself a pretty decent encounter. Anyway, love it! Also I commissioned artwork of the party from the fantastic Apple Cakes! I really love how well it captures the characters and brings them alive. Honestly it makes me regret not having done this for every other campaign I've ever run! Last edited by msully4321; 2019-02-14 at 02:28 AM. We had the first session with the full Blue Hand Group in quite some time! Unfortunately it is also probably the last in some time, with Cora and Salen both having vacations soon. This session was super interaction and RP heavy and there were a lot of really brilliant moments, a bunch of which I've forgotten, but oh well. The start of the session was very slow, since the Red Hand wished to purchase new gear in Brindol, but nobody had really looked into what gear they wanted. So first we spent a long time looking through the DMG magic item lists. From Immerstahl the Red, Salen bought a pearl of power and Aideen bought two (the price went up substantailly with each that he sold, since every one he sold is one *he* can't use!) and Cora bought Boots of Elvenkind. Additionally, I feel like every single party member asked Immerstall if he had weapons or armor for sale---and each of them were told that he enchants those, but doesn't sell them, and they should go to Shank's Shivs. This happened three or four times. Then they went to Shank's Shivs (Shank was a muscular woman with obvious prison tats, now gone straight and a succesful business owner) and bought a lot of magic weapons and armor with the frankly huge pile of cash they had collected. Zehra tried to unload the magic giant spiked gauntlet, but Shank didn't have any use for it so only offered like 20% of what it was worth. Cora asked if anybody else might be interested, and Shank directed them to Lady Verassa Kaal, a powerful local noblewoman (and also crime lord). Their purchases done, the party heads to Kaal Manor looking for an audience. Fortunately for them, Lady Kaal would be happy to speak to the illustrious Blue Hand Group, but unfortunately she would not be available until the next day, since she would be attending the final performance at Velorian's Playhouse. The usher told Zehra that no weapons are allowed in the theater. Zehra argued for a little while, before the rest of the party took her out of sight, put her axe in the bag of holding, and went back through. Zehra was grumpy. The play was The Most Lamentable Comedy and Most Cruel Death of Pyramus and Thisbe, which is I think from a Midsummer Night's Dream but honestly I haven't read it---it is just what kjones always used when he needed a play name. * Salen went and spoke to High Mourner Mhiram, the high priestess of Wee Jas. I mentioned that she recently had a very fancy new temple built, and nobody was sure where the money was from (this is straight from the module). Salen's whole backstory was about issues with corrupt priests of Wee Jas, so Salen did not trust her very much. The whole interaction was basically Mhiram and Salen going back and forth seeing who could say creepier things about death. It was a *lot* of fun. They discussed some of the planning and his frustrations, and noticed that he kept looking irritatedly over at Lady Kaal. It comes out that Jarmaath doesn't like or trust her---she's a crook and people whisper that if she called in the favors everybody owed her, she could take power from Jarmaath in a day. (Jarmaath thinks that if this were really true she'd have done it, but people still talk.) Despite all this, he needs to ask for her help---she has a small private army that he needs for the war. Hoss had been driving much of the conversation, but Zehra was taken aback by this! "Why have you not had her killed, then?" "Because we have the rule of law here, because it would be dangerous, and because if I had done so, I couldn't be asking her for help today." Zehra was not convinced: "Dangerous? You could do it right now, her men are unarmed." "They are certainly not." "... then why was I not allowed to bring my axe in." The conversation ended with Jarmaath crossing the room to speak to Kaal. A quick conversation, a handshake, and a smug grin on Lady Kaal's face was all the Hoss and Zehra could make of the interaction. * Meanwhile, Aideen was getting up to Aideen things. Teyani Suri, a Lion of Brindol, who had first brought them news of the Red Hand blockades, was on security duty. Aideen sidled up and made some small talk, before cutting to the case and asking her out for drinks. Unfortunately, Teyani turned bright red and sort of awkwardly replied "Oh, uh. Well, but... It's just... I'm married." "Oh." "I'm sorry." "No, it's fine." "I don't wear a ring, because I don't want to lose it in a fight, you know." "Yeah." "I'm flattered, though." Awkward. * Cora had my favorite bit, where she decided to sneak backstage! Slipping around past the green room and the dressing rooms and making it back to Velorian's office, she meant to leave a note, but found the proprieter (and lead of the play) in her office! Velorian is a retired adventuring bard who decided to open a theatre. It's been succesful, and is a cornerstone of both high and low Brindol society. Cora chatted with Velorian, and (like she had been asking to everyone else she talked to!) asked her if she knew anything about the Ghostlord or the Thornwaste (Hoss was getting somewhat frustrated about Cora's operation security difficulties). Unlike most of the other people, though, Velorian had heard some stories other than the normal bedtime stories: she had heard a tale in which the Ghostlord ruled over a tribe of savage lion-worshipping cannibals---and became a lich long before a battle with Rhest led his tribe's downfall. I wish that I had given her something more uesful than that, but it was a fun little scene. The party headed back to their accomodations in the Stone Wyvern and socialize some, before turning in in preparation for the next day. The next day, the party went together for their meeting with Lady Verassa Kaal, which was a thing of beauty. There was some quick negotiation: she'd pay a good price for the +1 giant gauntlet and 80 cents on the dollar for all the gems and artwork. Aideen bargained her up to 95 cents. And then Kaal dropped a bombshell: "I'll pay five thousand gold for the Ghostlord's phlactery?" "Come on. Five thousand gold." "No. What do you want with it?" Lady Kaal says that she would use it as leverage to make the Ghostlord fight the Red Hand... (and then, presumbably, whatever else she wanted). She wasn't sure the party or Lord Jarmaath would have the guts to do it. The Blue Hand Group turned her down, but Zehra asked what her problems with Lord Jarmaath. "He isn't doing what needs to be done. He didn't ask me for help until yesterday, he hasn't levied a draft yet, <a few more things I forgot>... And, frankly, he's always looked down on me." At some point, Hoss expressed some disgust with Lady Kaal, who interrupted him, saying "You were the sheriff of Red Rock, right? You were... ok. At your job." Somebody (Cora?) asked if she knew anything about the Thornwastes and---as it turned out---she had a map of it, with the Ghostlord's lair indicated on it... and she said she'd be happy to give it to the party in exchange for a favor. "What's the favor?" "A future one." Hoss said "no", and started walking out, followed by the rest of the party, before Zehra asked "Would you do it for a favor from just me?" Of course she would. The rest of the party was pretty mad (Hoss went to the guards' archery range and angrily practiced for a while), but it meant they didn't need to keep searching for a map. The Blue Hand Group then departed on owlback, discover as they take off that they actually have no consensus on what to do next! Will they destroy the phylactery, return it with conditions, return it without conditions? Will they hide it somewhere else first? Somebody suggested just flying over the lair and dropping it---which turns out would be a *terrible* idea, since the Red Hand has a bunch of agents there! And that's where we ended, with the party departing Brindol on owlback on---I think---July 22, with fresh gear, fresh tensions, a map, a phylactery, and the thinnest suggestion of a plan! * "Zehra loses track of the plot late in the first act and doesn't want to ask anybody to clarify." "It's a five act play." "Yeah." * Maybe Shank's Shivs shouldn't have had magic weapons. The price disparity between magic weapons and mundane ones is enormous! * After final bows, Velorian and the cast spirited themselves away from the theatre through a secret tunnel to disperse throughout the Vale as spies and scouts. Why? Velorian unsurprisingly has a flair for the dramatic---and she saw no reason to face her creditors *before* a war! * I really liked this session and I think a lot of the players did too. It was a nice change of pace and had a lot of good character moments. Hoss's player particular mentioned enjoying the intermisison scenes, where everybody got a nice vignette. * Genuinely my largest complaint about 5e is the lack of proper magic item pricing. People have made lists, but I was never fully satisfied with them. I kind of just made up numbers. * I certainly was more forthcoming with magic items for sale than the 5e guidelines suggest, but frankly otherwise there is just not a lot to spend money on! * I'm incredibly happy about Zehra agreeing to Kaal's deal in the face of opposition from the rest of the party. Chatting with Zehra's player, it's clear that Zera is basically totally prepared to be on Team Kaal. Intra-party conflict is often perilous, and as a GM I am happy to target my game to the players, but I absolutely *love* intra-party conflict as a GM. I love how it often lets me sit back and watch as the players generate all the content for long stretches. And I love seeing how the party overcomes their disagreements and succeeds despite their disputes---or doesn't! Of course, intra-party strife escalating ot actual combat should be exceptionally rare---not least because D&D just isn't a very good PvP game. * Argh also I need to figure out how to work in Salen's Wizard of Peχavn backstory and haven't decided how yet! * RHoD has a lot of great hooks for building things on top of. Velorian's being the big example here. This sounds like an amazing session, Sully. I love all the political intrigue and the way you've characterized the leaders and players in Brindol. I really love all the great little character moments (shoving a character on stage! Always a treat). And I love how you've set up the impending conflict with the Ghostlord. Obvious answer for how to handle the wizard of Pexan - tie him into the Ghostlord somehow! Seems like a natural fit to me. For this session, Cora's player was missing, but one of my old players from before I moved happened to be in town, and they filled in. The Blue Hand Group departed Brindol on owlback, continuing to argue about what to do next. The basic positions remained the same, and they argued for a long time. Like really a long time without really reconciling exactly. Zehra felt very strongly that they needed to talk to the Ghostlord, and volunteered, while Aideen wanted to try dropping it from owlback and going away. Salen really wanted to destroy the phylactery. They argued a lot without any real clear resolution. The third day of the party's flight, they crossed a road and spotted on it several goblins and two ettins looting a cart with human bodies scattered around it. The party killed the ettins and drove off the goblins with basically no trouble at all. On searching the scene, it became clear that the dead humans were Lions of Brindol, and their leader was carrying a letter to Captain Helmbreaker of the Shining Axe Company in the Hammerfist Holds (the dwarven strongholds in the mountains to the south). Carefully opening the letter while not breaking the seal, the party discovered that it was a signed mercenary contract, hiring the Shining Axe Company to the defense of Brindol! In the cart was a whole boatload of money to pay the downpayment. The party took a quick diversion to the Hammerfist Holds, where they arranged for the mercenary contract. They also chatted with the local head cleric and head bard, and I think they learned a little about the Ghostlord but honestly not very much, and then they headed back off. Around this point, the party finally got something to settle part of their argument. Salen cast Divination and asked Wee Jas what to expect when they got to the Ghostlord's Lair. I said: "Yeah, Wee Jas is kind of frustrated. 'You fools, the Red Hand is present.'" That substantially raised the stakes, but also ruled out any plan involving dropping the phylactery. Flying into the wastes, the party spotted a giant stone owl with two clear entrypoints: one between the front legs, and one in the mouth. Cora and Hoss took their owls and landed on back, and Cora climbed down to the ground, went up a staircase between the legs, and spotted Varanthian, a fiendish behir! After sneaking away without being heard, Cora climbed back up into the mouth, found a rope ladder that could be thrown down and a large double door. Cora opened the door, spotted three now-alerted hobgoblin monks, and ran away, alerting the party. The Blue Hand regrouped and poured into the lion's mouth to find that the doors had been closed again. Zehra kicked one of them down and a battle began, with the monks wielding obnoxious chains that could grapple and constrict enemies at range. Aideen launched a fireball in, trusting that Zehra could save and have the damage reduced to 1/4 after fire resistance, which worked fine. The fight was pretty easy for the party, except for one snag: with two of his friends down, one of the monks did a short-range shadow teleport thing, grappled Aideen with his chain, and jumped out of the mouth of the lion! Some piddling falling damage was taken, and then Hoss ran up to the edge of the mouth and put the monk out of his misery. Zehra, however, didn't know the monk was dead, and so jumped out of the mouth herself to finish him off! This left Zehra and Aideen on the ground, split from the party, as Varanthian, a Huge fiendish behir, blue and scaled and crackling lightning, lumbered down the staircase towards them! * Zehra is too tall to stand upright in the Hammerfist Holds, so her player kept his head cocked to the side the entire time they were there. Zehra really wanted to go. The big question I need to answer now is, what should Varanthian's first move be: blasting Aideen and Zehra with lightning is likely to be super effective, but if Varanthian can successfully swallow one of them it will be super cool! I don't know! For this session we had a rare full cast, but Sam's player was still jetlagged so we made it a short session. Because it was short and so combat heavy there won't be too much to this post. I decided that Varanthian swallowing people was just too iconic to pass up, so that was going to be her goto move. Since we had stopped for a week, I had everybody reroll initiative, which gave Zehra a chance to move forward and roar---unfortunately for her, Varanthian made her save and charged in, missing Zehra with a bite attack but grabbing her in an enormous claw. Most people were in the mouth of the lion, and had to reposition before they could be useful. I think Cora jumped out onto the paw, while Hoss and Salen fastroped down the rope of climbing. I think Salen missed a dex save and took some damage, but it wasn't a lot. Aideen blasted Varanthian with a fireball, but between a made save and fire resistance, it wasn't too helpful. Zehra was in desparate straits, so she spent her turn healing herself before being swallowed whole by Varanthian, who then used her other attack to hit Hoss, who had done quite a bit of damage the round before with a (not actually well-advised!) sharpshooter attack. Honestly, Varanthian should have done a lightning attack here. It could have hit three party members. But the eating was really funny, and there was still a chance she'd make it to the third round! She didn't, though. Hoss and Cora riddled her with arrows and Salen hit with a spiritual weapon, before using Curse on her to buff the next attack. Varanthian was at 2 hp after the spiritual weapon, so if Salen had cursed first he would have gotten the killing blow! But instead, whether Zehra died came down to whether she could hit, at disadvantage, from inside Varanthian's stomach. She declares that she is doing a maximum smite---which does extra against fiends---and narrowly connects. The player starts picking up dice, and I stop him---"you kill her, how do you want to do this". He tells me: "nah, I'm gonna roll damage first." Zehra does 68 damage to the inside Varanthian's stomach, rolls out in a spew of blood and viscera, and shouts "THAT'S WHY YOU DON'T EAT ME!". The party got enough XP to level, and I told them that they would level at their next long rest. They didn't want to stop yet, so they continued through a secret door they found in Varanthian's lair. Continuing up through the secret passage, they had two not terribly interesting fights with ghost lions. In the second fight, Cora had her HP drained and was actually frighteningly close to death, but escaped without any serious damage. Reaching a dead end, Cora found another secret door. Zehra opened the door, only to find a room filled with fog. Zehra's player says "I close the door. ", the party backtracks, argues about where to camp for a while, settles (I think) on going out into the wastes a bit and camping, and has a long rest. Everybody levels up to 8 and I send everybody home early, on the night of July 25. * The adaptation has the ghosts as immune or resistant to literally every energy type that a wizard or sorcerer can produce. I decided to be nice and say they didn't have electricity resistance, which Aideen managed to eventually discover through trial and error. * The Paladin smite ability doing extra damage to fiends makes sense if you are thinking of a traditional LG paladin serving a god, but Zehra is definitely not that! It doesn't make any sense for Zehra, a paladin of conquest whose devotion is to the idea that she ought to be a ruler of men, to do extra damage to fiends. Zehra has no particular beef with fiends! Zehra's player pointed this out, but there's no real good way to change it that I can see. Just stripping it out seems to unfairly punish someone for having cool and unique fluff, but any change to make it fit the fluff better would probably make it too good. Oh well.